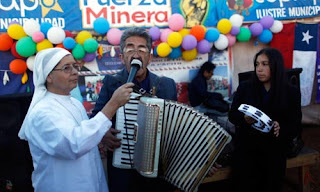 Religious Douchebags: Rival Churches Claim Credit For Chilean "Miracle"
It is the race within the race: while rescuers inch towards the trapped miners rival churches tussle over the miracle in the making. Evangelical, Adventist and Catholic clerics are vying to stamp their own particular faith on a surge in religious fervour as the drama nears a climax in Chile's Atacama desert. The three Christian denominations have each claimed credit for what they say is divine intervention in the survival – and expected imminent rescue – of the 33 men who have spent 67 days beneath the earth. "God has spoken to me clearly and guided my hand each step of the rescue," said Carlos Parra Diaz, a Seventh-day Adventist pastor at the San Jose mine. "He wanted the miners to be rescued and I am His instrument." 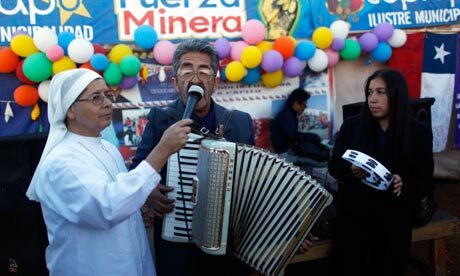 Yards from where he spoke Caspar Quintana, the Catholic bishop of Copiapo, prepared an altar to celebrate an outdoor mass for a small congregation of miners' relatives and phalanx of TV cameras. "God has heard our prayers," said the bishop. "I have received comments of encouragement from all over the world. Let us give thanks." Read More: Any takers for the responsibility of the mine collapsing in the first place? I guess drilling that big hole was a waste of time...they could have all just sat on their asses and prayed instead.